"You cannot step twice into the same river." "I remember the mountain mahogany," I said to Barbara, "but the branches seem so much larger now . . . and so contorted . . . and look how many have died!" And later I said to her, "I didn't remember that fireplace rock being so rough and red and weathered . . . I recall it as smooth and black." Memory is an impoverished country, its vividness effaced by time. Missing is the cursive detail of the limb that branches against an azure sky. 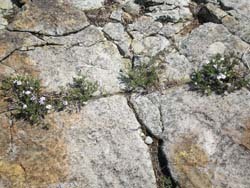 The glyphs and runes inscribed on weathered rock. The yellow filigree of staghorn lichen's scrawl. The quilt of phlox and larkspur written blue and white across the gravel slope. All these intricate messages in inscrutable scripts have been erased in recollection. All have been replaced by grosser shapes composed of dream and irreality. Ghosts that never were. I was ready to give it all up a year ago. The branches. The gnarled rock. The lichen. The flowers. The red-hued sunsets. The Milky Way wheeling across the ink-black sky. Backpacking. A way of life. Life itself. Your see, I was afraid. 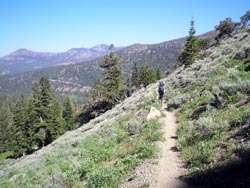 What would happen if I suffered another heart attack miles from the nearest trailhead? Far from ambulances and cath labs? Far from the pulse and thrum of civilization? I was afraid to die. Afraid to let go of all this . . . whatever it is. But there's the catch. No sooner had I surrendered to my fear and grown willing to give up all these things, than I discovered that I really had nothing left to lose. So Barbara and I decided to try an easy backpack to a place familiar. 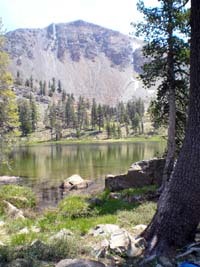 We selected a three-mile hike on the Pacific Crest Trail to Deadfall Lakes. There we had backpacked half-a-dozen times over the years, most recently with my niece Susan in 2003 (see Backpacking With Susan). True, it might not be all that exciting. We knew the place too well. Or thought we did. But what could go wrong? We spent Sunday night high above the valley heat at our favorite campsite at Scott Mountain Campground. Monday morning we were up with first light. Two other campers had sojourned there, and one left before we did. 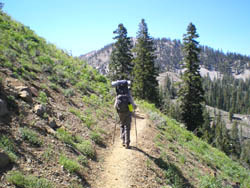 We packed up our backpacks and took off for Deadfall Lake trailhead. Large boulders made an obstacle course of Parks Creek Road, but did not block the road completely. There were five vehicles at the trailhead when we arrived (N 41 20' 35.1", W 122 32' 15.1", 6844 feet). One middle-aged fellow in shorts and flip-flops was talking on his cell phone. Probably to his stock broker. When he hung up, he told us that he and his wife were from Virginia and would be walking in for the day only. Every trip is different, even when we return to a familiar place. The red landscape of the peridotite dome at the trailhead seemed more vast and the tall pines and cedars more sparse than I remembered. The trail contoured into a long forest thicker and more extensive than I expected, before it climbed out across the exposed intrusion of granite scree and crumbling schist and into the lake cirque, walled by peridotite to the north and east and granite to the southwest, which I only half recalled. Along the way we met several groups of day-hikers, most of them hurrying by on their holy pilgrimage to the top of Mount Eddy. On that three-mile stretch to the lake we encountered four consecrated PCT trekkers, doggedly stepping off another link of the chain between Mexico and Canada. The first one, a cadaverous young man with a wild black beard and the fiery eyes of a half-mad saint, carried dehydrated fruits and veggies and a tarp. He had started out in April. 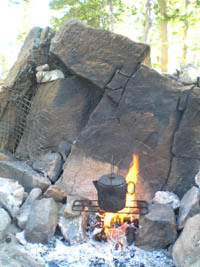 The second, a silent, wiry fellow toting a tent and three liters of water, had begun in May. They each tried for thirty miles a day. So pure was their devotion to the trail that they rarely raised their gaze, thus missing a lot. The final two, both bearded and stout, were hiking together. The packs they wore were heavier. Forty pounds, one said. Indulgently they strove for only twenty miles per day and smelled a rose or two. Near the lake we encountered a couple of backpackers hiking out. They said no one was camped at upper Deadfall Lake right then. The previous night they had had the lake entirely to themselves. We quickened our pace to claim the finest campsite. We took our favorite site in the mountain mahogany, white fir, and western white pine on the medial moraine above the lake's north shore (N 41 19' 09.0", W 122 30' 13.9", 7313 feet) and basked in the solitude there. This is where we had camped with Susan nine years earlier. We placed our tent in the same location as before, and agreed that hers had probably stood beneath a now-leaning snag. The branches of the mahogany looked different, as did the boulder anchoring the fireplace. Funny how time erodes the details of memory. The weather was warm with a cooling breeze. We felt fortunate to be alone in such a popular place. But our good fortune would not last. Late in the afternoon we heard and saw young boys hollering and bouncing about like hyperactive monkeys. Two adults were erecting tents in the boulders of the shrubby flood plain at the west end of the lake near the outlet stream. "I found a frog!" one ten-year-old screamed at the top of his lungs to his buddy a few feet away. Barbara thought they must be our dreaded nemesis: Boy Scouts. They yelled and screamed like Boy Scouts do. Then five backpacking ladies marched in, chattering loudly on the trail. They set up camp below us, right on the lake shore between us and the Boy Scouts. Soon a yellow inflatable boat was paddled across the lake by two men fishing. They returned in the boat to a family with two dogs camped in the meadow on the southeast corner of the lake. The sky was smokey toward the west, and the sunset glowed an intense red that turned the mountains framing it purple. The Boy Scouts screamed and shouted all that evening, but stopped as it grew dark and we retired. Then, at three in the morning, we were awakened by a woman's scream. Despite all that, we slept well. 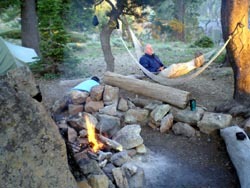 That first morning, Tuesday, was beautiful, calm, and quiet as we sat in our hammocks drinking tea. Ah, this is what it's all about, I ruminated. This is why backpacking is worth all the hassle. The fear of pain. The cold. Fatigue. The hassle. The bother. And then . . . this!" Peaceful and quiet at last, for a little while I lost the thread of story I tell myself. The narrative I tell myself that allows me to fit into this articulated world. Yet the irony is that only without my story line, only when the interior tongue had been stilled, do I became one with the world. 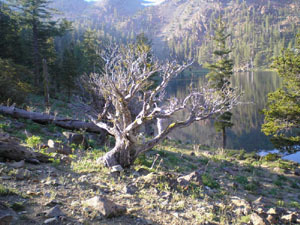 There are four Deadfall Lakes, two large and two small, with a fifth hidden off the trail and a name no one knows. 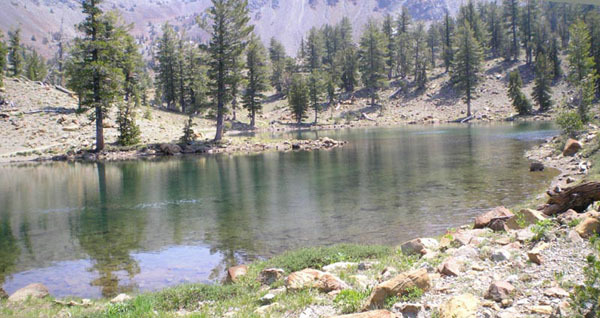 The two main lakes lie along each side of the PCT like grapes on a stem. The upper, larger lake sits to the southeast, the smaller, lower one to the northwest. We were camped on the moraine above the upper lake. We decided to hike up the Sisson-Callihan trail to the two smaller lakes nestled almost five hundred feet higher in the cirque below Mount Eddy's western face. Along the way we passed a Darlingtonia fen bordering a stream trickling from a grassy spring. 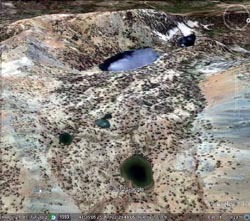 The short climb was relentless, culminating in a steep pitch up and over the terminal moraine that impounded the first of the smaller lakes. Years ago Barbara and I had camped on the gravel and rock at the exposed east end of this lake (N 41 19' 03.6", W 122 29' 34.3", 7748 feet), mostly to get away from the incessant chattering of children and the late-night partying at a bonfire where the old ASABP group celebrated advancing middle age. Framed by the red rock and stunted trees of the peridotite bedrock, the little lake seemed more stark and stunning than either of us remembered. We continued on to the fourth and highest of the lakes, a shallow tarn in a stand of conifers that included uncommon whitebark and foxtail pines. We had never spent time here before, either because we were powering up the trail on pilgrimage to the top of Mount Eddy, still fifteen hundred feet above us, or because the lake was occupied with campers. This time we were not going on, so we crossed the outlet stream on blocks of rock in a wet area and found a pleasant little campsite filled with wildflowers (N 41 19' 09.4", W 122 29' 29.8", 7779 feet). As we ate lunch, Clark's Nutcrackers invaded the trees, scolding us. One of the fishermen we had seen in the yellow boat came by and chatted with us. He was from Eugene and had seen an article in the newspaper there that touted Deadfall Lakes as the place to go when it was still too early to go into the Cascades because of mosquitos. We had seen a similar article in the San Francisco Chronicle. No wonder the place had become so popular! After lunch we circled the lake and found a drier, larger campsite on the southeastern shore near the trail (N 41 19' 08.4", W 122 29' 24.3", 7788 feet). Then we climbed up to explore a beautiful meadow at the foot of Eddy. A stream meandered through a wild, wet meadow and the barren cliff of the mountain loomed above, its face scarred by a slash of granitic intrusion. Foxtail pines predominated on the higher ground. The meadows and fields seemed alive with flowers. Barbara identified phlox, larkspur, mountain heather, shooting stars, Darlingtonia, scarlet gilia, western blue flax, blue stickseed, yellow lupine, yarrow, buttercup, leopard lily, pinedrops, wild currant, and wild blueberry. She had seen morning glory near the trailhead. We had figured that the week after the Fourth of July would be less crowded, especially at midweek. But there were many more day hikers on the trail, and new backpackers continued to arrive at our lake, some in large family groups with dogs and kids. By dinnertime all available sites around the lake were taken, and more backpackers were pouring in. One young couple even scratched out a primitive camp in the small copse which had been our latrine. As we were lounging in our hammocks, the yellow raft adrift again upon the lake, the neighbor men and boys strolled by, returning from their conquest of Eddy summit. Accosting them, I learned that they were not Boy Scouts at all, but merely grade school teachers and their pupils. They agreed that teaching silence and respect for others might be a fitting lesson. The woman's midnight scream, they told me, emanated from the camp between us. One of the girls had thought she heard a bear, but likely it was just a deer. After dinner we hiked down to the lower lake, on the west side of the PCT, by following a shortcut to the big campsite we remembered there. There we had camped years ago with Mr. Popper, his tent set up beneath a hornet's nest, before a blizzard caught us on the trail hiking out. All the campsites at the lower lake were taken. We spoke with a couple from Santa Cruz. They had seen a lot of smoke around Clear Lake driving on Highway 20. The whole valley had been filled with haze. This was their first time at Deadfall. The woman had torn the sole off her hiking boot on the way in, so we offered her our roll of duct tape to repair the damage for their hike out. Back at camp Barbara updated her list of birds we had seen: chickadees, Clark's nutcrackers, juncos, nuthatches, Stellar's jays, hermit thrushes, yellow-rumped warblers, and a hummer in our campsite. That night we saw another blood red sunset. Wednesday morning occasional mosquitos buzzed by, but they were lazy. Because we arose early, the morning was again quiet and serene, despite the crowds. The only real problem was the long ramble required to scout a new, uninhabited latrine. Taking down our tent, we lifted it to shake out the duff and debris and discovered a large, black scorpion poised in the center of the silver ground cloth. I had rarely seen a scorpion in these mountains, and never such a healthy specimen. We wondered whether it had lurked between the tent floor and the ground cloth, or had slept with us inside the tent. We had an easy hike out, slightly downhill on mostly good trail. It took us about an hour and a half. We counted ten day hikers and one dog going in. Parked at the trailhead were fifteen vehicles. The weather was hot and sunny, but hazy all the way into southern Oregon as we headed back to our cabin. And so I write these words. Affix a photograph or two. I do this not for you, dear reader. No, not for you, who do not exist. But for myself. Anything to keep it all from slipping away. Such vanity! Such folly! We ride the Mandala. The wheel that never stops. And neither you, nor I, nor all the gods, can slow its turning. I would as well hold back the setting sun.